We offer high quality custom designed brochures on a variety of different types of stock and with a variety of different folding options. 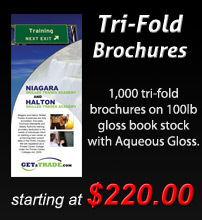 The most popular is the standard tri-fold brochure on 100lb text stock with aqueous coating, if you would like pricing for another type of paper or a custom fold please contact us. 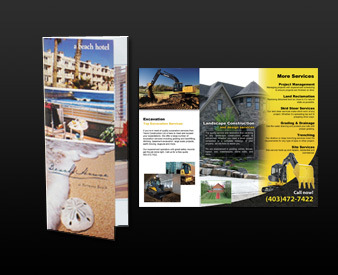 Our standard 8.5"x11" brochures are all double sided and our rates include design. 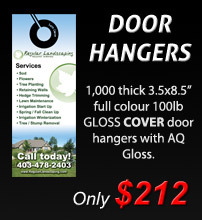 They are printed on a thick 100lb glossy stock and come with free aqueous coating. We have various folding options including: Tri-fold, Z-Fold, Half-fold and more. 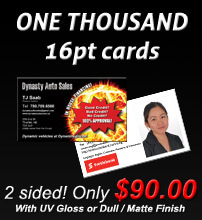 Please inquire if you need a specific type of fold, tri-fold is the default. Please inquire for pricing on other quantities * Prices do not include shipping or design. 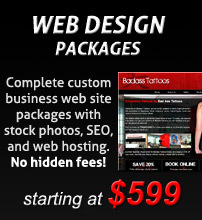 Request a design proof , a small deposit may be required depending on the project specifics. We will do a mock-up of the first page (cover) of your brochure before we require full payment. We can usually respond to your request within a couple of hours. * These rates do not include UPS shipping, although standard and 2nd day expedited rates for most orders are very reasonable. Please contact us to inquire! Do you need larger quantities? Our prices only get better!